Stars have paid their tributes to the late star Jackie Collins, as she dies aged 77. In incredibly sad news, writer Jackie Collins has unfortunately passed away. The 77-year-old died in LA last night, after a private six year battle with breast cancer. It was announced that the original pioneer of the ‘bonkbuster’, who wrote highly esteemed best-selling racy novels such as Hollywood Wives and The Stud, had died in a statement issued from Jackie’s family- ‘It is with tremendous sadness that we announce the death of our beautiful, dynamic and one of a kind mother, Jackie Collins, who died of breast cancer today’. The statement continued, ‘she lived a wonderfully full life and was adored by her family, friends and the millions of readers who she has been entertaining for over four decades’. ‘She was a true inspiration, a trailblazer for women in fiction and a creative force. She will live on through her characters but we already miss her beyond words’. Since the heartbreaking announcement, thousands have flocked to pay their respects to the literary legend- including some very famous faces. Sister Joan Collins posted a touching tribute to her ‘best friend’ in a tweet which reads ‘Farewell to my beautiful brave baby sister. I will love you and miss you forever. Rest in peace’. Despite Jackie having been diagnosed with cancer back in 2009, Joan had only learnt of her sister’s battle two weeks ago. Speaking to People magazine earlier today, the Dame said, ‘I admire how she handled this. She was a wonderful, brave and beautiful person and I love her’. Sharon Osbourne also tweeted her tribute to the star, which read ‘Shocked and devastated at the death of @JackiejCollins. Loved & respected her. Thoughts and prayers go out to her family’. Kris Jenner posted a moving photograph of herself, Jackie and sister Joan to Instagram. 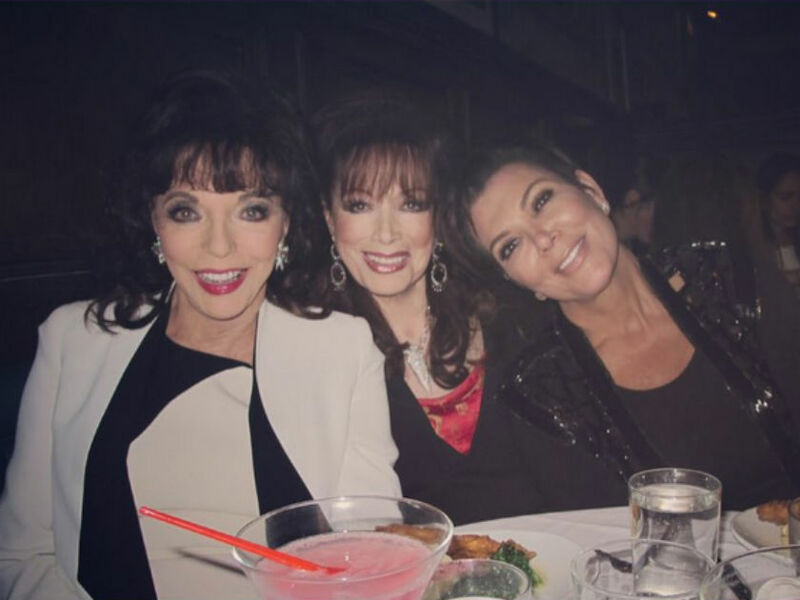 Kris captioned the snap, ‘I’m so sad to hear about the passing of Jackie Collins…’ and says the ‘amazing woman’ was ‘a joy and an honor to have known’. Oprah Winfrey also paid her respects, tweeting ‘#RIPJackie Collins. I always loved our interviews’. Graham Norton, who interviewed both Collins sisters on his talk show, wrote ‘I’m so very sad to hear about @jackiejcollins. She was the definition of a class act. Everyone who met her was Lucky’. I'm so very sad to hear about @jackiejcollins She was the definition of a class act. Everyone who met her was Lucky. TOWIE‘s Jessica Wright called the novelist ‘one of her favourite authors’. This was agreed on by Ex On The Beach star Jess Impiazzi, who was ‘saddened… that my favourite author has passed away after secretly battering breast cancer’. Our thoughts and respects go out to Jackie’s family during this hard time.